Resistors are considered to be the most used and the most important component of all the electronic circuits. Take a look at the working, types and also use of resistors in the field of electronics. We know that the basic idea of any electronic circuit is the flow of electricity. This also is further categorized into two â€“ conductors and insulators. Conductors allow the flow of electrons, while insulators do not. But the amount of electricity that we want to pass through them depends on the resistors. If a high voltage is passed through a conductor such as a metal, the whole voltage passes through it. If resistors are introduced, the amount of voltage and current can be controlled. Thus “resistance can be defined as the ease with which something will let electricity flow through it”. A conductor has lower resistance than an insulator. The amount used by the resistor to control the electrical circuit is termed as the resistance. The definition of resistance is based upon the Ohm’s law given by the German physicist Georg Simon Ohm. The Ohm’s Law states that the voltage [V] across a resistor is directly proportional to the current [I] flowing through it. Here, its resistance [R] is theÂ constant of proportionality. The SI-unit of resistance is Ohm [Î©]. The higher multiple and sub-multiple values of ohm is kilo ohms [KÎ©], mega ohms [MÎ©], milli ohm and so on. Thus, the resistance can be defined as the voltage required for making a current of 1 ampere to flow through the circuit. If the circuit requires 100 Volts to make 1 ampere flow, then the resistance is 100 Ohms. Resistor is a 2 terminal passive device. The symbol is given below. The working of a resistor can be explained with the similarity of water flowing through a pipe. Consider a pipe through which water is allowed to flow. If the diameter of the pipe is reduced, the water flow will be reduced. If the force of the water is increased by increasing the pressure, then the energy will be dissipated as heat. There will also be an enormous difference in pressure in the head and tail ends of the pipe. In this example, the force applied to the water is similar to the current flowing through the resistance. The pressure applied can be resembled to the voltage. There may be cases where two or more resistors should be connected in a circuit. The simplest way of connecting them is in the series and parallel ways. 1/Rtotal = 1/ R1 + 1/ R2 + 1/ R3. The first equation was obtained from Jouleâ€™s first law, while the other two were derived from Ohmâ€™s law. The most commonly used resistors all look the same. They look like a small worm with coloured stripes on the side. There are many types of resistors available. The most common one ceramic rod wound by copper wires on the inside. The number of copper turns and the thickness of the copper determine the resistance of the component. The more the turns and lesser the thickness, the more the resistance. There are also resistors with spiral patterns of carbon, instead of the copper winding. Such resistors are used for making smaller value resistors. Let us take a closer look at all the resistors. The resistors with a ceramic rod wound up with copper wires are called wire-wound resistors. Such resistors have the effect of inductance as they have copper windings. Even though the wires are wound in sections with alternate reversed condition an inductance is produced. Thus, different types of windings are used. One type of winding is called the flat thin former method which helps in reducing the cross-sectional area of the coil to a great extent. There are also other types of windings called Ayrton-Perry winding and bifilar winding. Some wire-wound resistors have an aluminium case so that they can be connected to heat sinks which dissipate heat. They are usual resistors with a resistive element in the shape of a cylinder. The resistive element is a mixture of carbon powder and ceramic. This mixture is held together with the help of a resin. This mixture is embedded with wire leads. This is then attached to wires made of lead. The value of the resistor can be found out by a method called colour coding, which is painted onto the outer body of the resistor. If the concentration of carbon increases, the resistance of the component decreases. This type of resistor is not used so commonly now. Though this resistor was highly reliable, their overheating and overvoltage characteristics are not so reliable. This type of resistor is applicable for circuits working under a range of temperatures. The resistor is made by depositing a carbon film onto an insulating substrate. They can operate at a range from -55 Â°C to 155 Â°C. The voltage range varies from 100 Volts to 650 Volts with a resistance from 1Î© to 10 MÎ©. For a thin film resistor, vacuum deposition method is used to include the resistive material onto the insulating substrate. This type of resistor is commonly used for making printed circuit boards. This type of resistor produces accurate resistance as the whole process of its making can be controlled. Thick films are also produced in the same manner as a thin film. But they also have some additional compounds like glass and also a screen printing liquid. Both of them vary in their temperature ranges as well as prices. Thin films are more expensive than thick films. This type of resistor is made by coating with nickel chromium [NiCr]. The process of making this resistor is similar to that of thin film resistors. The difference will be in the compounds used. This is the most unique type of resistor which is used for current sensing. It has four terminals and is used in the milliohms and microohms range. Though they are used for measuring small currents, if the current is allowed to pass through a shunt mechanism, they can be used for measuring high currents as well. Through this mechanism the current is measured with accordance to the voltage drop across it. The shunt mechanism consists of two brass blocks. Inbetween them are strips of low temperature co-efficient of resistance alloys. Large bolts threaded into the blocks make the current connections. There are also other types of resistors like lead arrangement resistors, grid resistors and so on. There are also variable resistors like the tapped resistors, metal oxide varistor (MOV) and strain gauge. To know more click on the following links. The value of the resistance is found out by colour coding. The resistors have a band of colours shown in their outer covering. 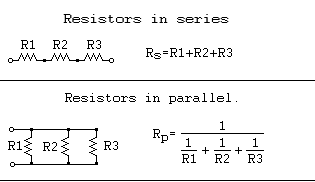 Here are the steps to determine the value of the resistor. 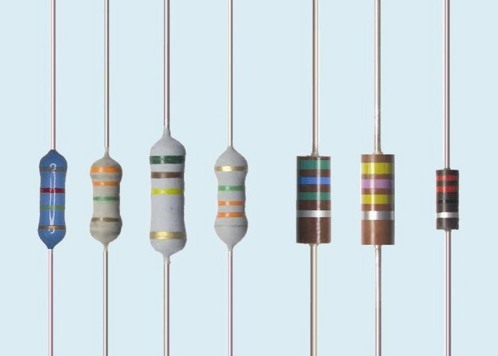 All resistors have three bands of colours, followed by a space and then a fourth band of colour. The fourth band of colour will be brown, red, gold or silver. To read the colours turn it to the position such as the three consecutive colours come on the left and then the space and the rest of the colours. The first two colours from the left indicate the first two digits of the value. The third colour represents the digital multiplier. That is, it indicates how much you have to multiply the first two numbers with. Thus if you have a resistance with the first three colours being brown, black and red, the value of resistance is 10*100 = 1000 ohms or 1K. The last band, after the space indicates the tolerance of the resistor. This indicates the range of accuracy of the resistor. Thus, along with the three colours above, if the fourth colour is gold, it means you have a tolerance between +/-5%. Thus the actual value of the resistance can be between 950 Ohms and 1K. There can also be resistors with five colours. If so, the first three represents the digits, the fourth will be the multiplier and the fifth will be the percentage of tolerance. 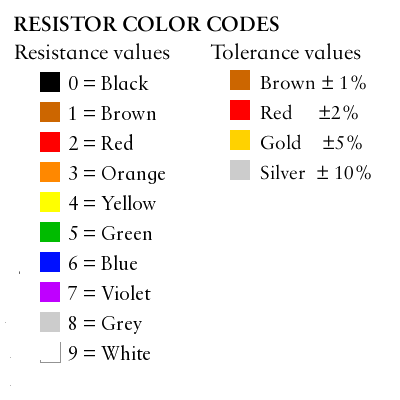 This indicates that a more precise value of the resistor used can be obtained from a 5-colour resistor. Take a look at the colours and their associated numbers given below. Though resistors can cause wastage of electricity, it has a lot of advantages and applications in our daily life. Resistance is one of the main ingredient in the working of a light bulb. When electricity passes through the filament of the bulb, it burns bright as it turns extremely hot due to its smaller size. Though this mechanism wastes a lot of electricity, we are forced to use it to obtain light. The light used nowadays are highy efficient than the older incandascent lamps. The similar filament working is the main ingredient in the working of some of our usual household stuffs like electric kettles, electric radiators, electric showers, coffee makers, toasters, and so on. The application of variable resistance is also helpful to us. Our TV’s, radios, loud speakers and so on work on this principle. confusing that where to use resister. pls i need all the details of resistor in my mail box. i am an engg. student i want to know that if i have to make a new circuit it is very confusing that where to use resister. capacitor, and which ic should be choosed and how to connect it either in series or in parallel. plz can you help me…. Hi, test out the various circuits in this website. Don’t worry as your study progresses, you will be able to solve it yourself. i want some knowledge about resistor, capacitor. Awesome Article, makes lots of sense, it explain a whole lot. YA THIS IS A BASIC KNOWLEDGE OF ELECTRONICS.WHOLE OF THE ELECTRONICS IS BASED ON THESE RESISTORS. DEPENDING UPON THE USEAGE WATTAGE OF THE RESISTORS ALSO MATTERS. Microelectronics has set into the electronics field and the surface mounted devices (SMDs). Semi conductor Resistors also have come. It would have been appropriate if you would have dealt with all those types too, including trim-pots and presets. Hope you understood my feelings. We need to update at frequent intervals. Thanks for the nice article. The following can be added: in the muliplier gold is for 10Ö¿Â¹( Ã· 10) and silver is for 10Ö¿Â²(Ã·100). This will enable us to represent 1ohm 5% Tolerance resistance as be Brown, Black, Black Gold and Gold. For 0.22ohm 5% Tolerance resistance as Red, Red, silver and Gold. Dear editor the next article can be on preffered values and on industrial metal film resistances of high accuracy tight tolerance and temperature coefficient – colour coding. I find Circuits today articles very helpful and interesting both for beginners and experts. If one keeps in touch with there articles one may considerably enhance is knowledge regarding electronics. I do appreciate sending me such emails so frequently. And of course I am very grateful to you. Thanks. How to select the right resistor for a given application? So, what about the different properties of the different types? (Temperature coefficients, precision, stability, noise generation? Besides, there are variable resistors, (potmeters, presets) and more exotic ones, like NTC, PTC, VDRs..